A few hundred runners cross the finish line each year in all three races combined at the Forest of Nisene Marks Marathon, Half Marathon & 5K, which takes runners on a mix of roads and trails through redwood forests, with fog from the nearby Pacific Ocean helping keep conditions cool for participants along the course. There’s plenty of shade under the canopy of trees throughout this race, which also is very hilly with challenging and steep terrain, especially at about the half-way point in the race, where the steep hill prompts many runners to walk just to get over. More than 120 runners crossed the finish line last year in the half marathon alone. Like the two other races in the event, the half-marathon race starts and finishes at the Aptos Village County Park. From there, runners follow the fire road that leads out of the park for the first three miles, and then run along eight miles of single-track trails through the Nisene Marks Forest before returning to the fire road for the last couple of miles of the race. Race organizers say that runners can expect to experience a gain in elevation of about 1,000 feet over the first eight miles of the course, and that runners should also look out for yellow jackets and poison oak along the course, as the race is run in June when both can be plentiful. While organizers place aid stations at several spots along the route, runners are encouraged to carry either a water bottle or a hydration pack with them during the race, as this is a trail race and the wait for the next water stop can seem long when you’re taking time to tackle the forest’s hills and terrain. Scheduled starting times for the races are 8:00 AM for the full marathon, 8:30 AM for the half marathon and 9:00 AM for the 5K. The race is hosted and organized by the Santa Cruz Host Lions and the Santa Cruz Track Club, and all proceeds go to benefit the Lions Club’s programs to assist the sight- and hearing-impaired. Set along the Northern California coastline, just a few miles east of Santa Cruz and about 80 miles south of San Francisco, Aptos typically sees mild to moderately warm (and occasionally cold) weather conditions throughout most of the year. On race day (June 1), the average low is 50ºF and the average high is 70ºF. See the race route map for the Forest of Nisene Marks Half Marathon here. To reserve your spot in the 2019 running of Aptos’s Forest of Nisene Marks Marathon, Half Marathon or 5K race, register online at Active.com here. 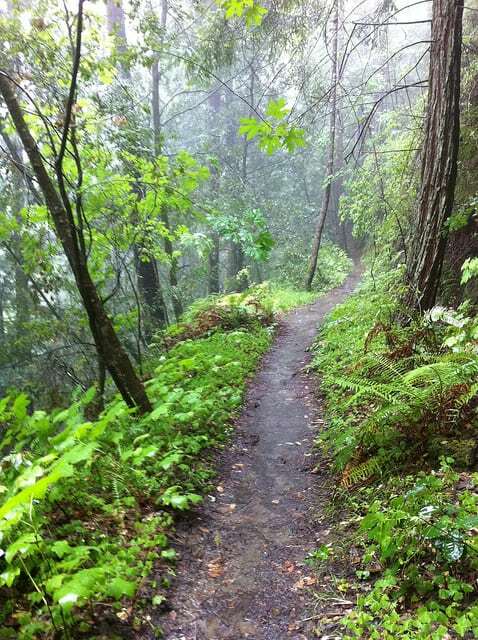 Ever run in the Forest of Nisene Marks Half Marathon? Share your impressions here, or post your review in the Comments below.